We've put up signs, called clinics and shelters, and placed ads, but her owners still haven't turned up. We think she was left in the ball field across the street from our house. She's healthy, can sit, shake, and understands the word "no". She is teething a little right now, and is very playful. She gets along extremely well w/ humans and other dogs. Is this baby currently at your home, Desi? Or is that just the wording in the ad? Pretty dog, I hope she finds a home. I live in GA and I have a friend who really wants this baby. He has a chow/keeshond boy who looks just like her and has been looking for a girl. Can anyone give me some more info on this girl? I know she is in Tucker. 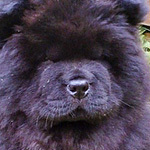 I am going to see this little girl today with a friend who has wanted a chow girl to go with his chow boy for a while. I had emailed him the picture of this sweet girl and we are going today to meet her. Desi, thanks so much for posting this. This sounds great! I hope it works out!! Beautiful little chowgirl "Sable" is now at her new home!! Desi, you are fabby for keeping an eye on Craig's List. I sent the picture to bunches of people - always looking for home any homeless chow. Well, I thought of a friend of mine who had wanted a girl chow to keep his boy chow company. He has a chow/keeshond mix and wanted a little girl who would look just like her. He said he would go look. So, I emailed the address you gave me and spoke to a wonderful lady named Patty. She got back to me this morning and so starts the story. Patty,with her neighbor Joe, saw this little chow girl (she's a tiny girl - only about 6 months) wondering around at a base ball field across the street from where they live. Joe, the neighbor was afraid that she would get run over or something, so he took her into his yard. I think that he and Patty tried to find the owners and took her to the vet. Joe couldn't keep "Sable" because he has two little dogs in his house. So, fingers crossed, we drove down to check her out. As soon as I finished work, I swooped up and picked up my friend and we took off. My friend brought his boy dog, Sam, to see if they would get along. Of course, we got there and just fell in love with little "Sable". Sam, being the aloofy boy chow, ignored her in the beginning and then did some zoomies to show off in front of her. It was wonderful. Joe and Patty were so worried that we would take good care of Sable and that we weren't some kind of weirdos. I hope that I assured them that we were OK. They could not have been more caring and conerned - it was fabulous to see how important it was that Sable went to a GOOD home. When we got home, we cleaned her up, gave her some water and food and some toys. Oh, she loves the chewies (raindeer horn and nylabones) And, I think we will have to wait to give her stuffed toys, as she demolished one in five mins in front of me. She must still be in the teeth-growing and chewing phase. Well, she just trotted around like she owned the place. She and Sam seem to be getting along fine. They play for a bit and then they go their separate ways - play again and then pretend they don't know each other. But, at least, she feels completely at home. We aren't going to leave them alone together for a while - till they get to know each other better and we can be sure they don't have any problems. Look at me...Saying "WE", like she's mine. I swear if my friend hadn't taken her, I don't know if I could have come home without her. See, I can't do this kind of stuff. I would end up with wall to wall chows!!!! And, my friend, well.....it's like he just got a new baby...you know the human kind! He's ecstatic. I am just so happy - you woulda thought I was the one bring home a new baby!!!! ANOTHER CHOW BABY FINDS A WONDERFUL HOME!!!! I am just beside myself with happiness!!! Sorry, I did rattle on, didn't I.
Desi, did I remember to thank you? Desi - thank you, thank you, thank you!!! This is one chow baby that's going to have an AMAZING home!!! Wonderful news!!!! Thanks Desi and Mia...you guys are awesome!!! Great news!!!! You're a doll for e-mailing all your friends .I wish I could take them all myself,and one day I might be able to,but for now I'll just have to leave it at cross posting and hoping someone will be able to take another one. Craigslist Atl is loaded with weirdos and half the posts are either breeders or re-sellers,a lot of the other posts are people bit(hing about breeders or re-seller,but if i can get one chow saved once a year,it's still worth the time! Well Ms Desi - you just saved your chow for the year. And you couldn't have picked a cuter little chow girl!!! When I saw her photo, I thought of Karen's Shiloh. She was about that same age when she just popped up in their yard one day. She has one photo of Shiloh watching her-from a distance at the beginning! Sable is lucky. Lucky that Patty found her, Desi cross-posted, and Lise saw it. It is nice to see the internet used for things like this. If you can use the attachment thing, Terry gave it more space. 500 or 600 pixels across makes a nice size photo without having to use the extension arms. Thanks Ms Auddy - I can do the attachement thing. As soon as I get some pictures, I will post. Another wonderful rescue story! With that dark muzzle and coloring, Sable does resemble my Shiloh. Hope to pictures of Sable and Sam soon! This is such a great story with a happy ending. Well done Desi and Mia. Can't wait to see the pics. Here is little Sable, with her new brother Sam and my Chutters and Mia. (Sable is the small - Sheltie-coloured pup, Sam is red, Mia is black and Chutters is the cream/red fluff ball. She's pretty!Curious to see how her coat turns out when she's older,my Cinnamons coat is still changing color. Sable has the neatest coat - kind of like a sheltie - a little grey, but she does have the strong chow guard hairs on her back. But, her fur is so, so soft. Softer than my guys. Sable is a cutie - she's got the big Chow paws! Sam is very handsome, too! All 3 look like they were having a good time. What a great story. Sable is a lucky puppy. I took special notice of the pictures of Sam. First time I've seen a picture that looks so much like our rescued Chow mix, Casha. Here are her pictures (from rescue puppy days to today - 5 years old). Thanks for sharing! I just wanted add an update. Sable is doing GREAT!! She loves her new Daddy and brother and, of course, they spoil her. She comes over often to play with my guys. She is a little fire cracker. (We think she has much more Sheltie than chow - but she is adorable). She has more energy than her chow brother and my two chows - so she plays with each one in turn. When she wears out one chow, she moves onto the other. By the time she gets back to the first chow, he or she has been able to rest and is ready to play again. What a cutie. I love Happy chowwy-ever-after endings! !